It was a match up that gave all of the indications that a very close and competitive game was about to begin. 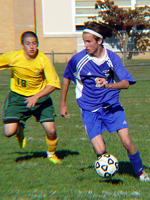 The first round of the South Jersey Group II boys' soccer tournament began at Sterling High School with the ninth seeded Cougars from Schalick taking on the Silver Knights who were the eighth seed. Both of these teams had the players that could single-handedly take control of a game, but it would be a team effort that would decide the outcome. Schalick appeared to have the emotional edge during the first half that Sterling was able to withstand especially when a goal by Mike Delp scored the eventual game winner. With the 1-0 victory, the Knights move on to the next round and compete against the top seeded Pirates from Cinnaminson. Each and every game a team will have one, two or maybe three players who have the right individual match ups enabling those players to take control of a game. A team would then begin to look for those right situations for those players and begin to receive positive results. It was Kierstyne McGuire's turn to lead the Silver Knights from Sterling field hockey team on several good scoring chances against Woodbury. For two halves, the Knights were able to kept most of the play in the attack zone and they would be rewarded with a 3-0 win. McGuire recorded a goal and two assists in a totally team effort. The month of September has been good for the boys' soccer team from Aubudon. The Green Wave had not loss a single game and was on top of the Colonial Conference Patriot Division with eight wins and one tie. The Silver Knights from Sterling were trying to halt their two game losing streak and they were trying to do so at Audubon. The home team would get the game's first goal, but it would be Sterling who took control of this game during the second half. The Knights' Ed Harmon scored three goals to lead his team and pick up the win by a 5-1 margin. There's always that expectation that the seeding designated for a team should determine the outcome of a game. The higher seed, in this case Audubon hosting Sterling, is the favorite to come away with the victory. Well the sixth seeded Green Wave from Audubon didn't disappoint the predictions when they took on the Silver Knights from Sterling who was the eleventh seed in the South Jersey Group 2 bracket. Three key hits during the bottom of the second inning proved to be the difference in this game as Audubon advanced to the next round with their 4-1 victory. Next up for Audubon would be a trip to third seeded Woodstown. There's always that one team others have to chase in the standings and when that opportunity arrives to compete against top team, try not to waste the opportunity. The Green Wave from Audubon had the honor of representing the Colonial Conference as the first place team but not far behind them were the undefeated Silver Knights from Sterling. The Knights would be looking to pick up their eleventh win in a row and were looking to win their second game of the regular season against Audubon. Sterling would make up an early deficit and defeat Audubon by a 4-2 margin. Steph Kroski picked up the win for the Knights limiting Audubon's scoring chances during the late innings. The Green Wave from Audubon got their season off on the right track when they hosted the Silver Knights from Sterling. Through seven innings, the Wave would pick up the 7-6 victory by rallying for three runs during the bottom of the sixth inning. This Colonial Conference game would be won by Tim Bolburian for Audubon. The next game up for the Wave would be another home game against the Gateway Gators. Sterling would look to pick up their first win of the season when they travel to Haddon Heights. 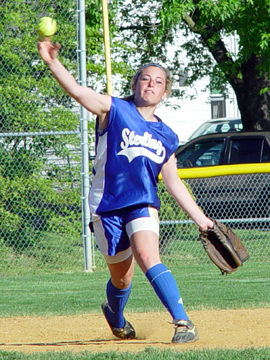 The Lady Knights from Sterling have had their share of close games during their run at the South Jersey Group 2 title. No matter how close you come to picking up the victory, what matters is that your team is on the winning side of the game. Sterling had upset the number two seed in this tournament and they were looking to knock off one more from the bracket. Third seeded Haddonfield would not take any chances of being upset by the Knights as they played an aggressive defense through four quarters. That defensive stand would be enough for the Lady Bulldogs to post a 38-29 victory over Sterling and move into the South Jersey Group 2 finals against Haddon Heights. Football over the Thanksgiving weekend has been a tradition that dates back for quite some time. The holiday dinner usually begins with waking up to an early morning high school game and then a number of games slated for Thursday. The Panthers from Collingswood and Silver Knights from Sterling would get the extended weekend started under the lights at Sterling High School. Both of these teams had qualified for the post season, but today was about entertaining all in attendance to start out the holiday football tradition. All of the scoring of this game occurred during the first quarter and Collingswood would hold onto their 7-6 lead and pick up the win. It was amazing the way this game ended. No matter which team you were cheering for, it was an emotional roller coaster. The sixth seeded Panthers from Camden were in another situation where they had to win to move on. Winning a key game during the regular season allowed them a chance to capture the South Jersey Group II football title. Standing in their way were the third seeded Silver Knights from Sterling who featured arguably the best versatile player in the area with Arthur Ellis. The Panthers could not stop Ellis, but they were able to contain Sterling especially during the final moments of this first round game. An apparent touchdown on fourth and goal would be called back and Camden would hold on to upset Sterling 24-20. The Panthers will now host Collingswood next week. It was the start of the season that every team is trying to achieve. Winning the opening day game whether on the road or at home seem to motivate the entire team into believing that the coaching staff’s game plan has a new meaning. Collingswood was playing host to the Silver Knights from Sterling, but on this day the visiting team would walk away with the victory. Playing in a Colonial Conference boy’s soccer game, Sterling used four different players to post a 4-0 win. For quite some time now, Audubon has been successful at defeating every opponent from the Colonial Conference. Their success even goes back several years as they have been the softball team on top of the conference at the end of the regular season. Sterling who was right behind them in the standings was looking to avenge their one run loss earlier in the season and came pretty close to achieving their goal. It would the defending champs snapping a scoreless tie through five innings by scoring all of their runs during the last two innings. Audubon would pick up their seventh victory of the season with a 6-0 victory. As we approach the month of May, teams are beginning to identify themselves as being labeled as having a chance at the title. Two of those teams amongst the top of the Colonial Conference were the Silver Knights from Sterling and the Garnets from Haddon Heights. Sterling’s starting pitcher Paige Cauley helped her own cause by belting a two run homerun in the first inning only to see Haddon Heights tie this game two innings later. 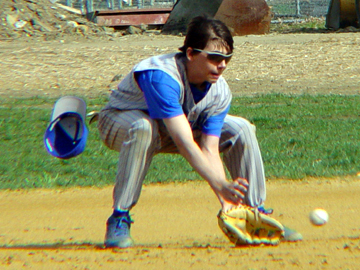 It took a four run inning to finally put this game away for Sterling as they defeated Haddon Heights by a 6-2 margin. Five times the players from Sterling greeted someone at home plate in celebration of a homerun. Two of those homerun celebrations occurred during the first inning thanks to Steve Williams and Chris Cook. With that much excitement occurring during the Silver Knights game at Gateway, one would expect Sterling to extend their winning streak to seven games in a row. A seven run first inning was more than enough for starting pitcher Drew Slickmeyer to pick up the win and a 10-1 victory over the Gators in a Colonial Conference competition. Depending on which side field you are sitting on, it’s always nice to have one of those games were everything goes your way. Knowing that no team or game is an easy win, Sterling would have their way against Gateway in a Colonial Conference competition. Starting pitcher Paige Cauley delivered a one hitter for the Lady Knights and also came up big at the plate as well. A four run first inning was more than enough to win this game, but a five run fourth put this game away early for Sterling and cruised to a 12-0 victory. The Lady Knights from Sterling were fresh off of claiming the South Jersey’s Group 2 title against Collingswood. Their next quest was a state championship but they had to get through Rumson-Fair Haven in the semifinal round played at Southern High School. Senior Kelsey McGowan poured in a game high 22 points for Sterling, but the Bulldogs from Rumson manage to stay one step ahead and pull way during the third and final quarters. When the buzzer sounded indicating the ended of the game, it would be Rumson-Fair Haven advancing to the state finals with their 52-44 victory. The Bulldogs from Haddonfield High School continued their dominance by defeating their nearest opponent in the South Jersey Group II tournament. The second seeded Silver Knights from Sterling were looking to end Haddonfield’s twenty-three game winning streak during this championship game. The Bulldogs would continue to use a team effort in breaking down Sterling’s defense late in the second quarter and put the game out of each during the third. Haddonfield had five players score in double figures which led to 80-57 victory. So far this season, three teams have dominated the Colonial Conference in boy's basketball and those teams are Haddonfield, Sterling and Collingswood. On each of those teams you will find that go to guy or guys that have been called on to come through with that big basket when needed. Today's match up between the Knights from Sterling traveling to Collingswood was no difference. Senior Justin Dempsey broke Collingwood's school record during the game with his game high 31 points. But on this day, Sterling's fourth quarter was the difference and the game winner erasing their deficit to win by a 66-57 margin. It was one of those games were the impossible occurred. On paper, this game looked to be a lopsided victory for the fourth seeded team hosting a thirteen seeded team. The Sterling Knights field hockey team has had a very successful season posting an impressive record in a very tough division. There efforts awarded them with their first trip to the postseason ever and getting a chance to play on its own field against Haddon Township. With a goal in the first half and another in the second half, the Lady Hawks were well on their way to celebrating an upset victory. Haddon Township will face fifth seeded Bishop Eustace with their 2-0 victory. Back and forth these teams went for most of the game looking for the right moment and opportunity to score that first goal of the game. For the Panthers from Pitman, they have been successful finding ways to win games and it shows as they have secured a position in the upcoming South Jersey Group 1 playoffs. The Knights has been coming up on the short end this season but it didn't show in this non-league game at Sterling. With the game entering its final minutes, Mark Thompson placed a shot into the net for the only goal of the game. There are still goals to achieve even late in a season when your team hasn't performed to the standards they know they can play. For both Sterling and Triton, they have been watching the leaders in their division come up with the wins they needed to stay on top. Today, the focus was on a different task of winning a game between two struggling programs. The Mustangs attempt of winning two straight games fell short as Sterling scored twice in the second half to come away with the shutout. For one half of the girls' soccer game between Haddonfield and Sterling, the outcome was not clear. Haddonfield hadn't loss a single game so far this season and they were only leading by a single goal to the end of the first half. The Lady Knights had put together a mini-winning streak and were looking for the big upset to extend that streak to three games. This game was the tale of two halves as Lady Bulldogs turned up the pressure scoring four more times. 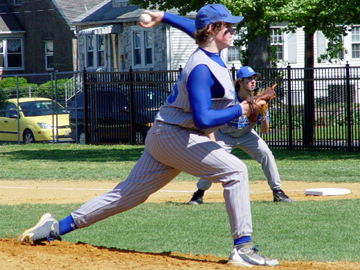 With Haddonfield's 6-1 victory, they would keep their undefeated record in tact. Depending on which side of the field you are standing on, trailing in a game is never in the game plan. The goal is to jump ahead of your opponent and get the momentum going on your sideline. Both of these teams have experienced that situation this season. Paulsboro has gotten off to a good start picking up two victories and no losses. Tonight, the Red Raiders were celebrating their early seven point advantage. That's when the host Sterling Knights quickly switched the momentum to their sidelines when Art Ellis' 93 yard kickoff return was the start of their 20-7 come from behind victory. The girl's soccer team from West Deptford went out on the field at Sterling High School and dominated the play both offensively and defensively. Head coach John Cobb was very actively instructing his team on their way to a 5-0 victory. Scoring chances were plentiful for the Lady Eagles as the early lead led to a team relaxed and playing smart for the rest of the game. Jenna Lindsay scored twice for the Eagles and Colleen Hee who played all but the final minutes of the game preserved the shutout.